After months - maybe even years - of speculation, Snapchat's parent company Snap Inc. has officially filed for a $3 billion IPO, the most significant move in the company's history to date. The documentation was filed with the U.S. Securities and Exchange Commission today, and it offers a heap of insights into where the platform is at, including active users and revenue data - the first time such information has been released. 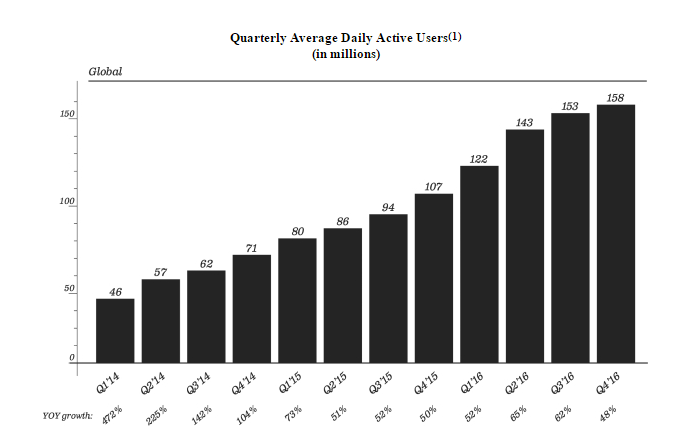 First off, on users - Snapchat had 161 million daily active users in December 2016 - up from 107 million in 2015. That's higher than the 150 million daily users the app had reported back in June, though given there's been six months between then and now, that growth rate is not astonishing, which is interesting when you consider the possible impact Instagram Stories may have had on this aspect. Indeed, within the documentation, Snapchat notes that growth has decelerated - down from 17% between Q1 and Q2 2016 to 3% between Q3 and Q4, the period after Stories was released. This supports recent reports which suggested that Stories is already hurting Snapchat, which could have significant implications for the platform's future growth prospects. On engagement, Snapchat says that users spend around 25 to 30 minutes per day in the app, while over 25% of them post to their Story every day - with equates to around 41 million users. Snapchat also says that 60% of their Daily Active Users use their Chat element, which they gave a significant upgrade last March. There were also more specific notes about their audience and the use of in-app functions. "The majority of our users are 18-34 years old. This demographic may be less brand loyal and more likely to follow trends than other demographics. These factors may lead users to switch to another product, which would negatively affect our user retention, growth, and engagement. Snapchat also may not be able to penetrate other demographics in a meaningful manner. For example, users 25 and older visited Snapchat approximately 12 times and spent approximately 20 minutes on Snapchat every day on average in the quarter ended December 31." Not exactly a ringing endorsement of the app's wider potential. 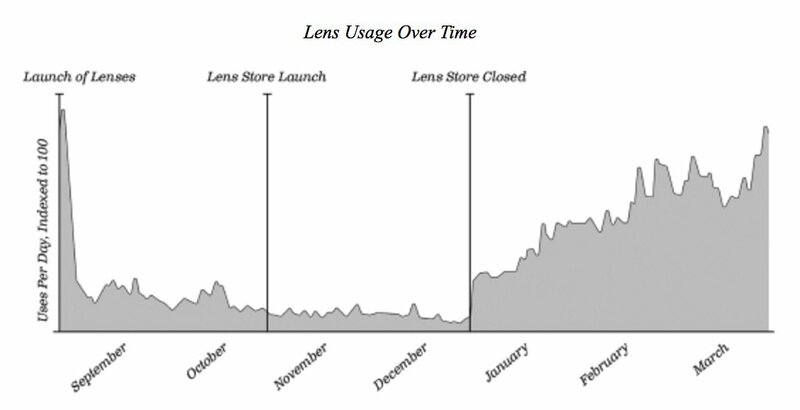 On in-app tools, Snap Inc. also provided this graph on Lens usage, which shows how popular the tool has become over time (which is why Facebook's working to replicate it). In terms of revenue, Snap Inc. reports that it made $404.5 million in 2016, up from $58.7 million the previous year. Snap Inc. also notes that they're generating $1.05 in revenue per user, a 239% jump, year-on-year. The filing also says that Snap Inc. paid out $57.8 million to Discover publishers and other content partners in 2016 - up from $9.6 million in the year previous, while the company now has more than 1,850 employees. "We have incurred operating losses in the past, expect to incur operating losses in the future, and may never achieve or maintain profitability." It's an interesting report, and an interesting time for the ephemeral content app. Definitely, the challenges are immense, with Facebook working to curb Snapchat's growth every way they can, including targeting markets where Snapchat hasn't yet gained a foothold, which could effectively fence them out. But there is more to Snap Inc. than just Snapchat. While the company's very secretive, and we have no indications of their full plans, as we reported yesterday, it is possible that there's a lot more to Spectacles than we're currently seeing. That said, if there isn't more, if there's no major innovations coming that Snapchat can use to fight off competition, there could be difficult times ahead. Now investors need to make a call on which way they see things headed.